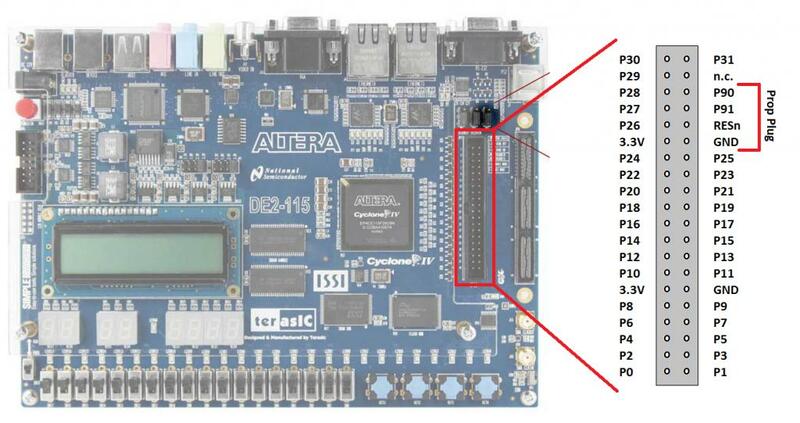 * Propeller 1-2-3 FPGA Board (#60054) "A7"
Please note you will require Quartus II v15 for the Cyclone V based boards. There has been a lot of discussion following the P2-HOT. Not much of it is referenced here as it was largely in a state of flux. 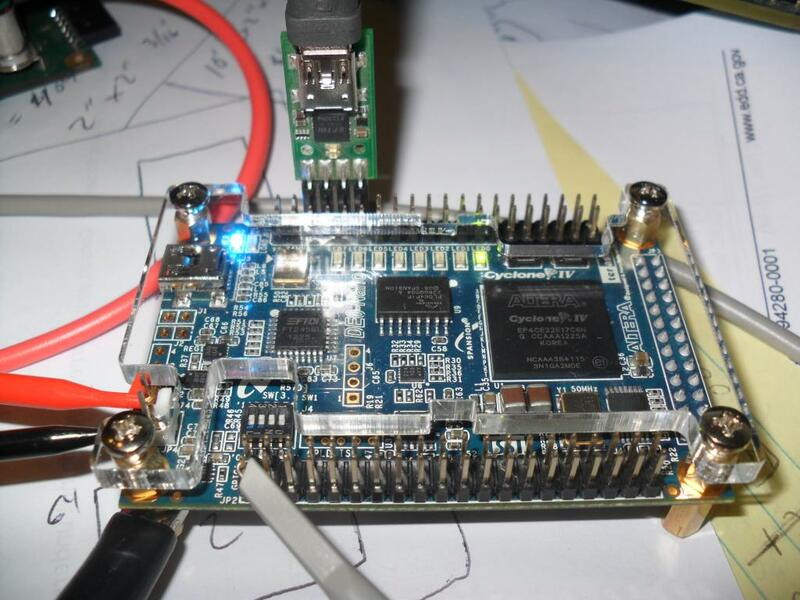 - a 1 cog Propeller II emulation (with restrictions) that runs on a Terasic DE0-NANO FPGA board. 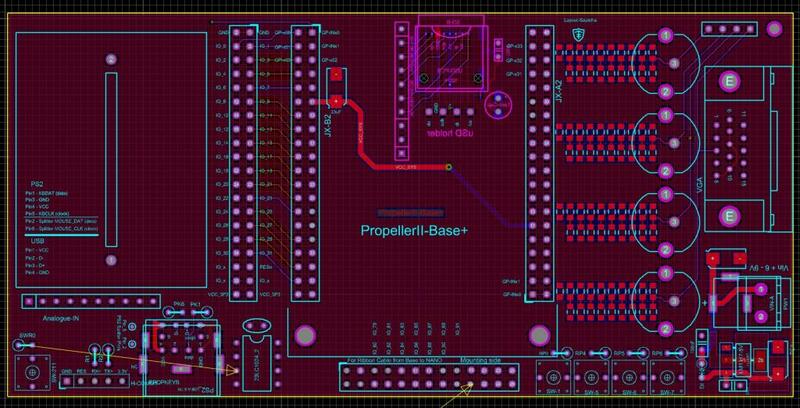 - a 5 cog Propeller II emulation (with restrictions) that runs on a Terasic DE2-115 FPGA board. About a month ago, the P2 hit a considerable snag with power being way too high. * Some form of Smart I/O. Prior to this snag, there were two P2 FPGA code postings. These were interim released without full documentation. Dates 19 Mar and 24 Mar 2014. If you really want to try them, please search the P2 forums. 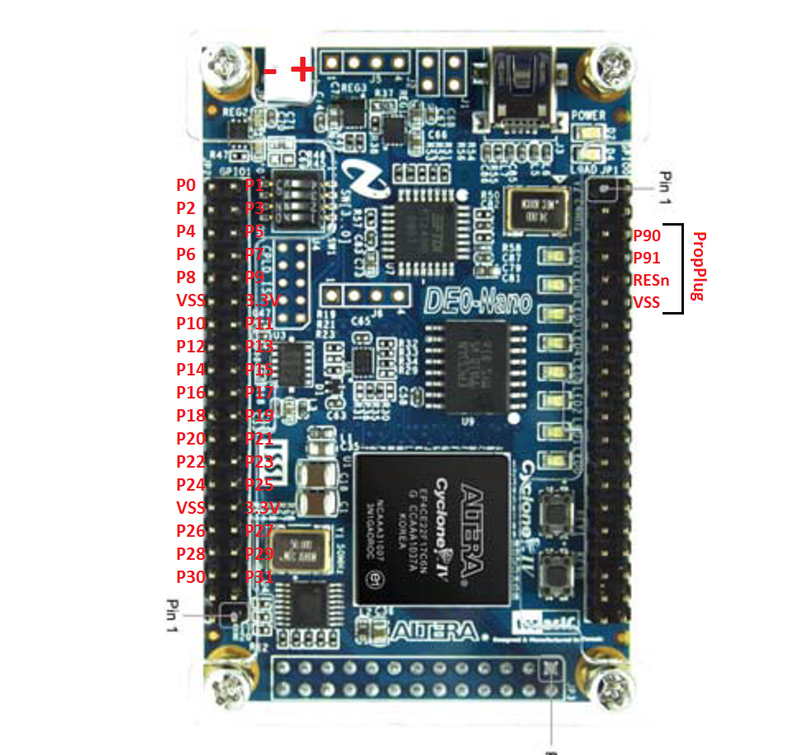 This follows on from the current 8 core P8X32A propeller microcontroller. The propeller chips utilise soft (intelligent) peripherals, so that the one chip can have many different peripherals that can even be dynamically changed on the fly. The propeller utilises a large SRAM rather than FLASH making software changes on the fly a reality. Way to go Chip & Parallax! This thread is for discussions specific to the P2 emulations on these FPGA boards (Altera Cyclone IV FPGAs). I try to keep this post updated with the latest information and links, so please let me know if something needs updating here. Beware the instruction set has major changes - even better than the last impressive changes - Fantastic work Chip! Beware the instruction set has changed - really impressive changes - Congratulations Chip! This code only works using the Parallax expansion board. A shunt/jumper on JP3 pins 3 to 5 on the DE0 board. The SPI Flash must be removed from the socket on the expansion board. A new FPGA download (10 Apr 2013) for both the DE0 & DE2 for accessing the SDRAM is here (the DE2 is a few posts earlier), together with P2 PASM example code for the SDRAM.. Both downloads include an example spin program. This has setup instructions for the FPGA boards at the top of the file. Both downloads contain the PNUT.exe which is similar to the PropTool - it has an editor and P2 compiler. If you want to contribute then go to the Google document and request sharing. I have an Excel Spreadsheet summary of the P2 instruction set. For now, scan from the end of the thread backwards for the latest post (it is a zip file due to forum restrictions). Only the downloader is required. I downloaded the Quartus II Stand-Alone Programmer (Windows exe 128MB = 12.1_177_program_windows.exe and is !142MB). Next I plugged in the DE0-NANO (via the miniUSB port). Windows could not locate a driver. I downloaded the Driver.rar (see D.P. 's thread above for this) and unzipped it. and Browsed to the unzipped Driver folder and clicked on something like manually look in this folder and sub-folders. The driver was located and installed. Download the Emulator & Pnut.exe and view the pictures (.png files) in the download for the setup. * Click on the Program/Configure and the Verify boxes for this file (note the Program/Config also selects for the default image too). * Click Start and your FPGA will be programmed/verified with the P2 emulation. Check the progress bar to ensure success. * Close Quartus II program. * Disconnect power to the DE0 and the USB connection. * Connect your PropPlug to the DE0 (or expansion board if using this). * Launch PST and hit <space> and you should see the Propeller II Monitor prompt returned. No doubt there will be a lot of suggestions for changes to the emulation. Suggest by all means to reach a consensus, but don't interrupt Chip from his work in getting the P2 documented and out. Here is the original thread about the P2. The emulation discussion starts around page 40. WARNING: There are two DE0 FPGA boards. The IS the one you want. I got the Terasic DE0-Nano board working! Chip: This is absolutely brilliant and revolutionary. No other vendor is this open! What a way to get a head start on getting software (and hardware) ready for the ultimate P2 release. Chip: Do you think we need a separate thread for the DE2-115 or do you think we should just use this one? This thread should be fine, since I'm making them behave the same way. I haven't been able to test this, since my DE2-115 board died, but I'm fairly confident that it will work okay. If not, I'll fix it after I get a new DE2-115 board tomorrow. That's great! Does that mean that the PCB you've been designing for the DE2-115 board isn't actually needed? Just the stock DE2 board is enough? Yes, if you don't care about having a nice SPI Flash hookup. Bill Henning was pointing out that we could map Prop2 pins to many of the DE2-115 peripherals and get our DACs that way, for example, via their VGA circuit. Both the DE0-Nano and the DE2-115 boards have big SDRAMs, as well, that can be connected. If it is possible -- Can You map even SPI on DE0-NANO that handle Analogue-IN ? I'm sitting here with a very big smile on my face. Now, to load this onto the board and try not to let any of that magic smoke out! Thanks heaps Chip. Once again, this is a fantastic company, if you guys had come up with the Arduino (but Prop based) then Parallax would totally smite the rest. But we are going to work on that. Now I think I have all parts in correct place. Some of them connected to ! Sure! The first thing we need to standardize across the two boards is the open pins 31..0, the serial pins 91..90, the SPI flash pins 89..86, the SDRAM pins, and then we'll have about 16 left for other stuff. Wow! It looks really good. Boards laid out by hand always have a nice flow to them. That's an awful lot of stuff for one cog, though. That is more worthy of the DE2-115 board. I'm getting the corrupted message just like Bill did. It's the standard software that comes with it. Entire work belong to Parallax. The Quartus web help is circular, if your file is corrupted then replace it with one that is not -- or -- convert the sof file from a later version. So I either need an sof file or download and install the multi gigabyte Quartus monster. Any luck yet? I can't remember what all you have to do, but I know you need the USB plugged into the DE2-115 with it powered up and SW19 set to 'PROG'. Then you need to get into the Altera Programmer software and select Active Serial Programming. Then you load that .pof file I put in the .zip. You might need to Add Device and select an EPC64 (or something 'EP64'). Once it's all set up and the Programmer software sees your USB hookup (which you might have to monkey with the menus regarding), you're ready to click Start and get the board programmed. After that, disconnect the USB, put SW19 into 'RUN' position, and cycle the power. The board should wake up thinking it's a Prop2. You might need to download the big Quartus mess. That file should be fine. I renamed it from top.pof to what it's called now. Maybe the name is embedded and causing a problem. Try renaming the file to top.pof. Okay, I'm wrangling with the software, trying different things. I had been able to download and run demos that came with it. I'll keep on plugging away and let you know as soon as I have had success. I initially had the "JIC file corrupted" message trying to program the DE0-nano using Quartus 11.sp1. Then downloaded the standalone programmer from Quartus12.1 ( https://www.altera.com/download/software/prog-software ) and that worked fine. So you don't need to download and install the complete Quartus web edition. Don't forget to powercycle the board after programming, that was my initial error. The FPGA configuration is loaded from the EPCS16 device into the FPGA on poweron. I will start working with the DE2-115 board now. Thanks, I had already done that and just downloaded the 12.1 programmer but I'm still doing some wrangling. Okay, looks like I needed to tick the tiny little program box, it's loading in slowly now, it should be right. Just noticed while downloading, that Altera warn their website will be down for ~6 hours on Friday evening. And I can work with Pnut.exe, running the example Chip gave in the Spin file now. Too bad I have other duties today,will try more later this evening. PS the signals on the DE2-115 connector are cleaner on the oscilloscope than those from the DE0-nano. Must be the series resistor and protection diodes on the DE2-115 board. Okay, I've started coding my Tachyon by starting with the serial transmit routine. I am gleaning some information from examining the PNUT.exe binary and the detailed preliminary features list. Is there more information elsewhere or is that the stuff that's still coming? EDIT: I'm wondering about the default clock modes etc. I just tried transmitting which works but I need to get the timing right. I have my very first HELLO WORLD code, it's rough but it's functional. I manually tuned the baudrate and it comes out at 460,800 baud at present, nothing fancy. djnz    R1,#txbit       'another bit to transmit? Peter, have you experimented with the Multiply and Divide instructions? I guessed everyone are curious on these as well. I need to check out the clock modes to make sure I have it set right and then I might check the maths. Why You place Stack in COG -- If You can use CLUT for that ?